If you’re looking for the best board games for adults, looks no further. This list includes everything from classic board games to newer adult board games that you’ve probably never heard of before! 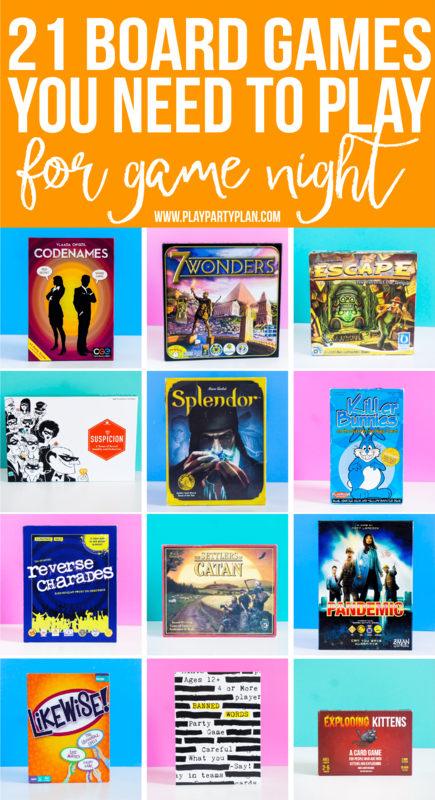 If you something new to play for game night, pick one of these board games and you’re guaranteed to have a good time! I’ll be the first to tell you that I’m a board game addict. My parents have been getting me at least one board game for every holiday and my birthday since I was like 12. Don’t believe me? Here’s a picture of our board game closet and you can’t even see the board games that are hiding behind the first line of games. 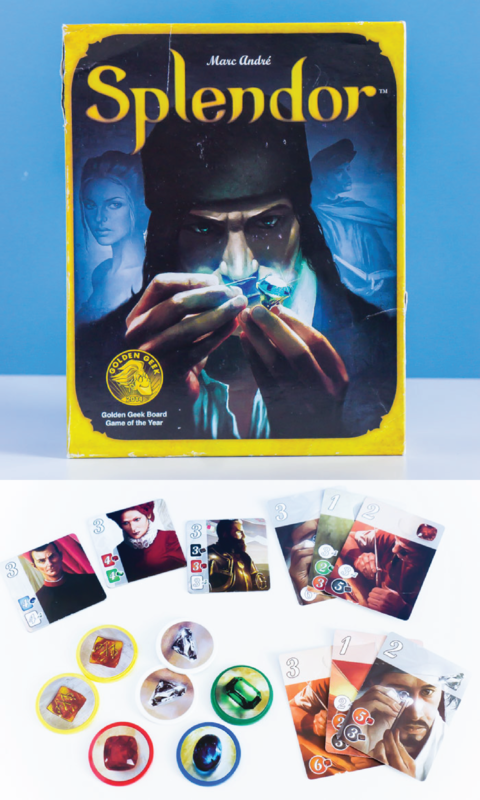 Here’s a sneak peek what’s coming in this list of adult board games! Why Board Games for Adults? Because most of my favorite childhood and adult memories happened while I was playing board games with my family. Now that all of my siblings are adults, we stay up all night at least once when we get together playing the newest board game I bought. I also think that playing games, whether they’re party games for adults, or strategy games, allows people to open up more than if they were just in a random cocktail party or happy hour. These board games for adults are the ones I consider the best based on my own experience. I’ve played every single one of these board games and highly recommend them all. I’ve also broken them into different sections so you can decide what type of adult board games you’re looking for and start in that section. I also included a photo of both the game box and the pieces inside the games. 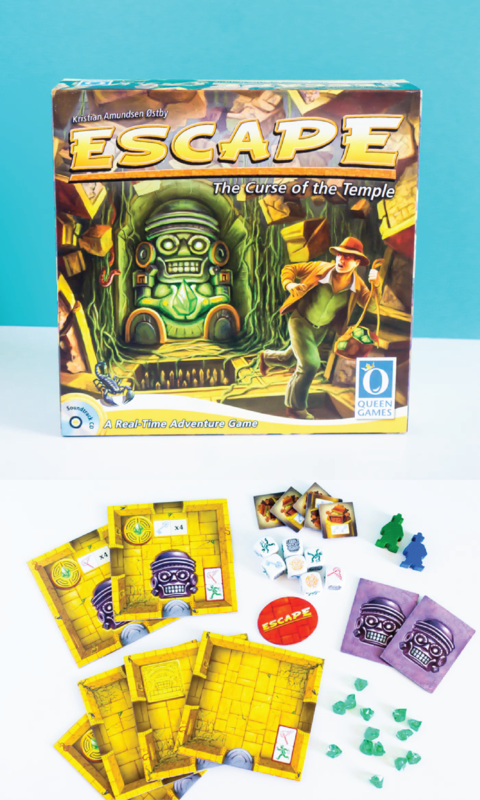 I’ve found that you can typically tell how complicated a game is by how many and what kind of pieces there are, not always, but enough that I thought it might be helpful to see the game box contents! And then you might understand what I’m talking about in the description anyway. There are a few without contents photos, and that’s because those were being borrowed by a friend when I wrote this post! I’m starting with strategy games because they’re my current favorite. I’ve included both competitive and cooperative games in this category as long as it includes an element of strategy. If you’ve never played a cooperative game before, they’re games like Pandemic where the team is working together to beat the clock or to beat the game. Sometimes life has a little too much competition already and cooperative games are a fun way to be competitive without being at each other’s throats. If you want something a bit less competitive, try these board games for groups! 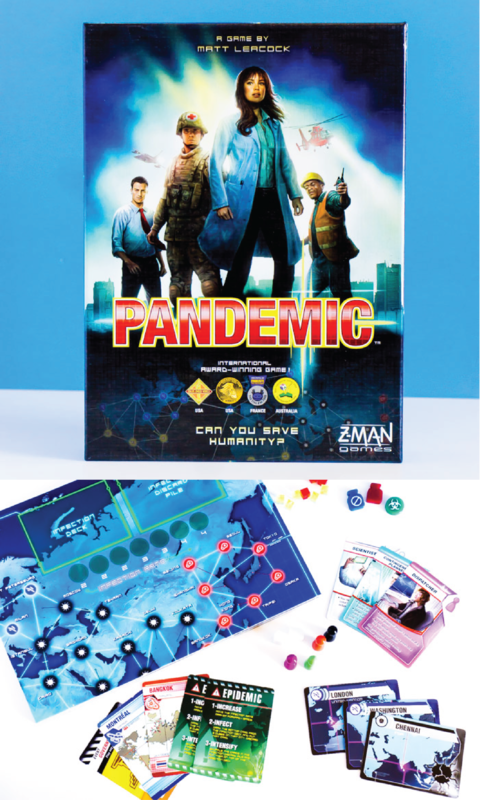 In the Pandemic board game, you’re working as a team to try and rid the world of diseases before they outbreak and take over the entire world. Each game is a little different depending on where the outbreak starts and which characters you randomly draw. It was our introduction into the cooperative board game world and is still my favorite. There’s also a new version of Pandemic out these days called Pandemic Legacy, which is basically like Pandemic on steroids. Okay, maybe not. It’s designed to be played by the same four players every single game month after month and as you beat the game, you open boxes, which change the game completely and you have to continue playing the game like that from then on. 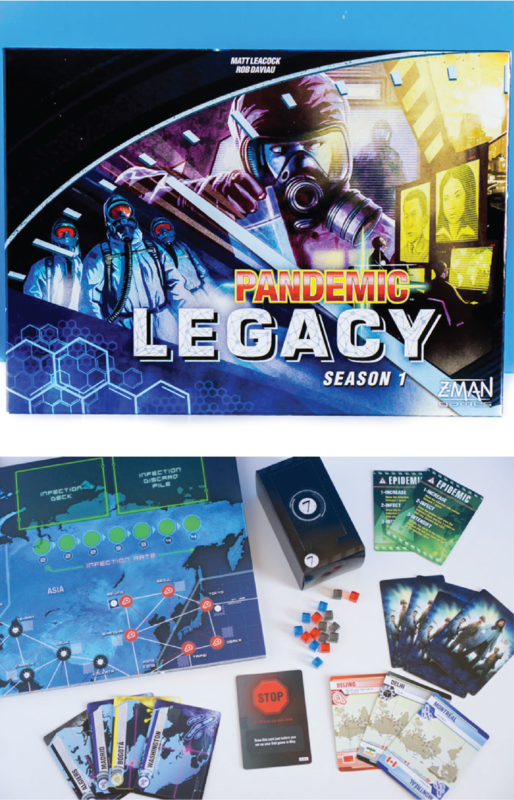 Unlike the regular Pandemic game, Pandemic Legacy is one that has a finite end – once you’ve beat the game a certain number of times and opened all of the surprise boxes, it’s over. But the journey to get there is amazing. Escape is not for the faint of heart. It’s a quick, heart-pumping, stressful game that is about as thrilling as any of these adult board games get. You work as a team to try and build the path to get out of a temple and unlock the door by rolling dice all at the same time. And you have to do it before the soundtrack, yes an actual soundtrack, sounds the final gong and you’re locked in the temple forever. It’s a ten-minute game that will have you stressed to the max, in a good way, for the entire game. This is one of those games that takes a bit of figuring out but once you do, it’s super simple to play. In the 7 Wonders board game, basically everyone gets a land that has special perks at the beginning of the game. You go through three different rounds of picking and playing cards to try and earn the most points by the end of the game. It’s pretty easy once you get the hang of it and the graphics on the game board are gorgeous! Splendor is a bit tough to describe. The goal of the Splendor board game is to be the first to earn a certain number of points and you earn points by earning jewels, picking up cards, and building sets. 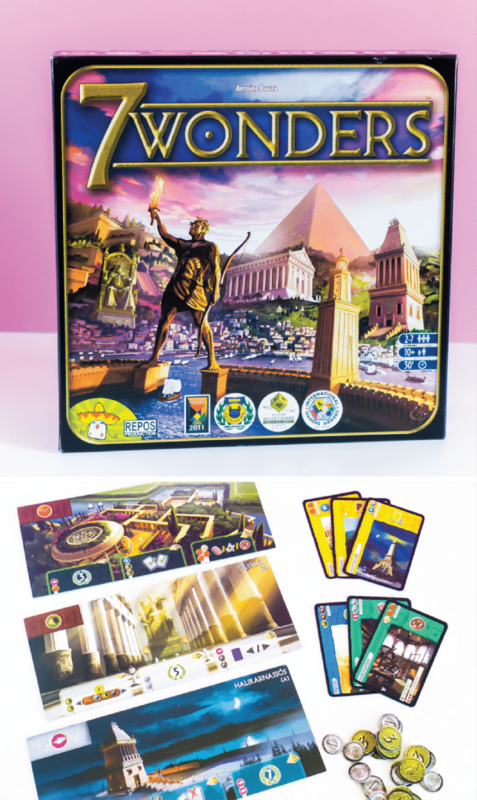 Like 7 Wonders, it takes a game or two to get the hang of it, but then it’s simple and typically fairly quick to play. It’s one of our current favorites. Settlers of Catan is one of the first strategic adult board games I ever played, and it’s still a family favorite. 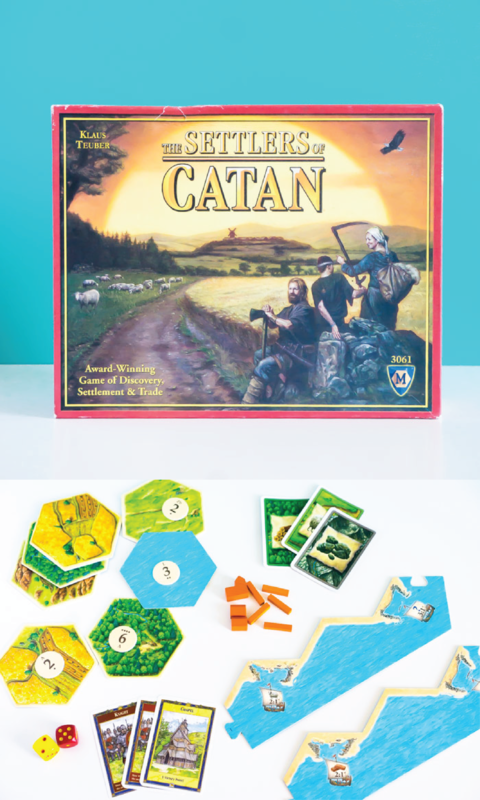 The goal of the Settlers of Catan board game is to earn points by building settlements, roads, and armies. You do that by gaining resources when numbers matching those resources are rolled on the die. It’s a combination of strategy + luck because the roll of the die can change the entire game. This is a great classic strategy game that most adults I know enjoy. I’m the only one in my family who doesn’t really love this game, everyone else does though so I kept it on the list. In Wits and Wagers, you bet money on different answer options to crazy hard trivia questions. Things like how many pieces of licorice would it take to get to the moon and anything else you never needed to know in your life. It’s fun, I’m just not a use fan of betting and wagering things, so it’s not my favorite. But you’ll likely love it like the rest of my family does! Killer Bunnies is a game that you really just have to play to understand. It’s a card game full of ridiculous cards and equally ridiculous play. And we love it. 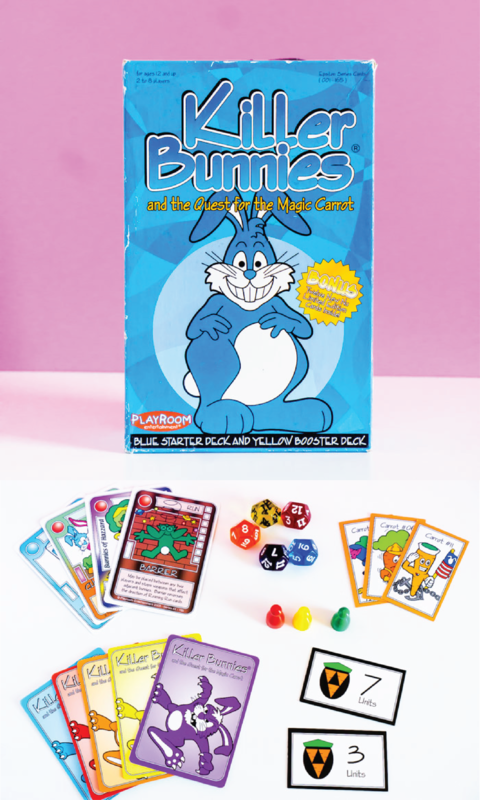 The basic idea is that you’re trying to kill bunny cards while also trying to gather carrot cards so that at the end of the game you have a chance to win (you have to have a carrot to win). It’s ridiculous and that’s why it’s so great. Don’t even ask me how many expansion packs we have. Exploding Kittens reminds me a lot of Killer Bunnies in the fact that it also has ridiculous cards with ridiculous captions. That’s where the similarities end. 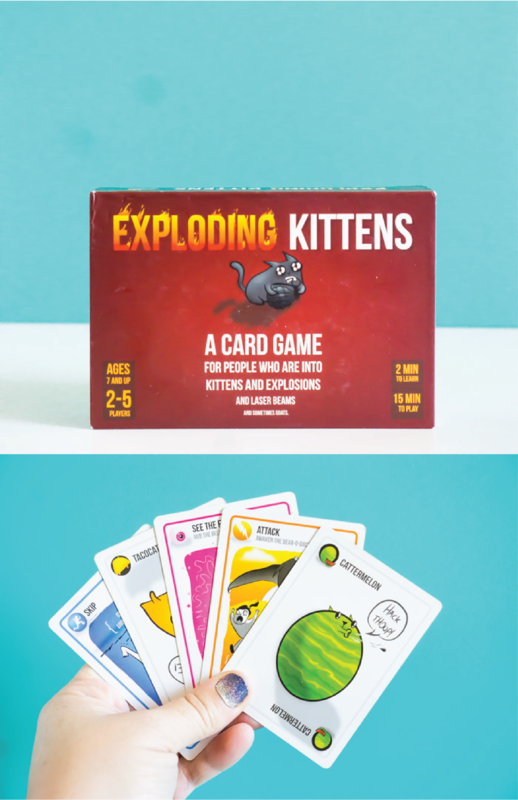 In Exploding Kittens, the idea is to explode your neighbors (or the rest of the people in the circle) to be the last one standing. It’s a super fast game that is pretty hilarious no matter what happens. There are also expansion packs to let more adults play. 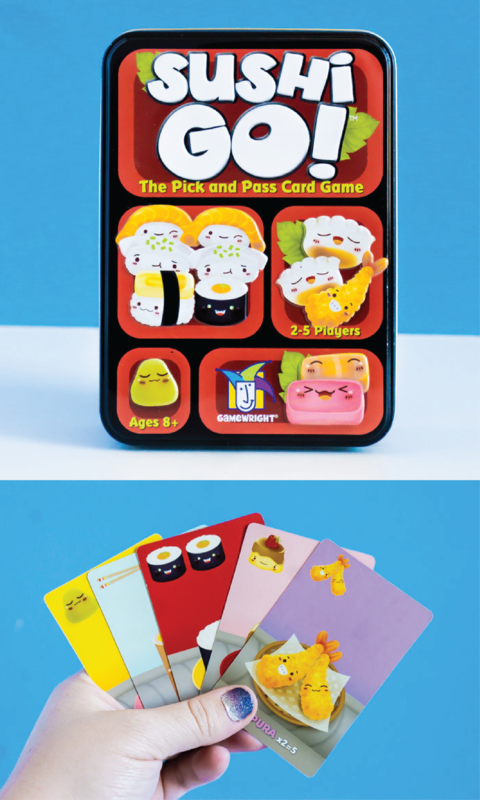 Sushi Go is a cheap card game I picked up for my husband’s birthday because he likes sushi, and we surprisingly love it. It’s similar to 7 Wonders in that there are multiple rounds and you’re trying to collect sets of cards to earn the most points by the end of the game. But it’s about 99% simpler than 7 Wonders and as someone put it in a conversation I had once, it’s a really good warmup game for game night. It only takes like 10-15 minutes to play an entire round and is simple for even non-game people to understand. Codenames is a quick and simple game, making it a perfect warm-up game to some of the longer games above as well. The idea is that you play in teams and you lay out these cards. Two spymasters know the secret identities of all of the cards (agents) and everyone else only knows them by their codenames. The teams compete to see who can figure out which cards (agents) are on their team first by using only secret clues. It seems simple but can definitely be more challenging than it seems! 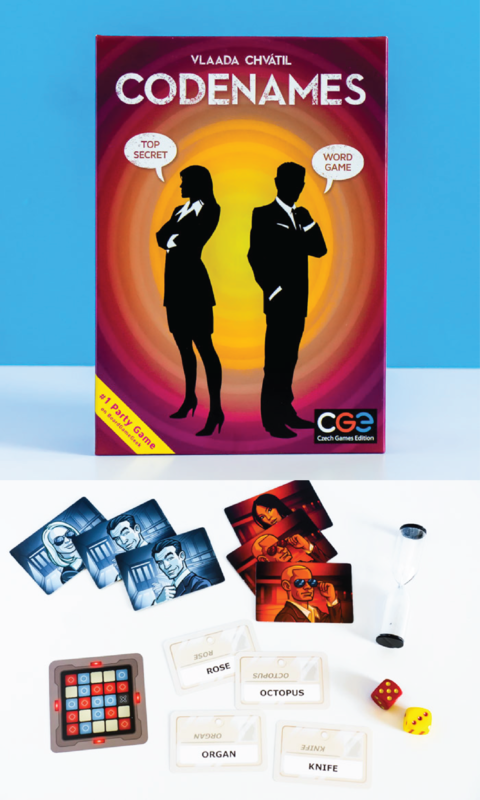 And bonus, there are a variety of different themed versions of the game – Marvel Codenames, Disney Codenames, and more! 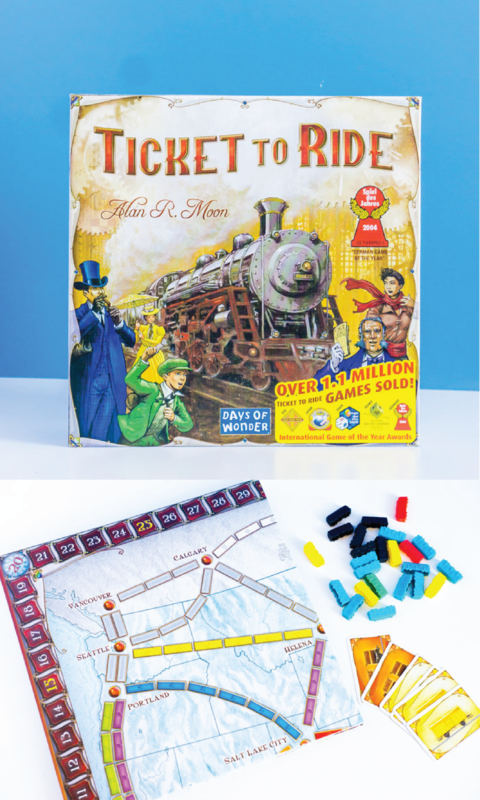 Ticket to Ride, or as my family calls it, The Train Game, is a classic strategy game where you have to try to use your color trains to connect one destination to another. The catch is that you have to collect colored cards to do it and that can be tougher than it sounds. It’s a good slow-paced game and a classic one that doesn’t take much at all to learn. I’d recommend this one if you’re playing with perhaps in-laws or someone who doesn’t do a lot of strategy games and isn’t going to get the complex rules of one of the more complicated games mentioned above. 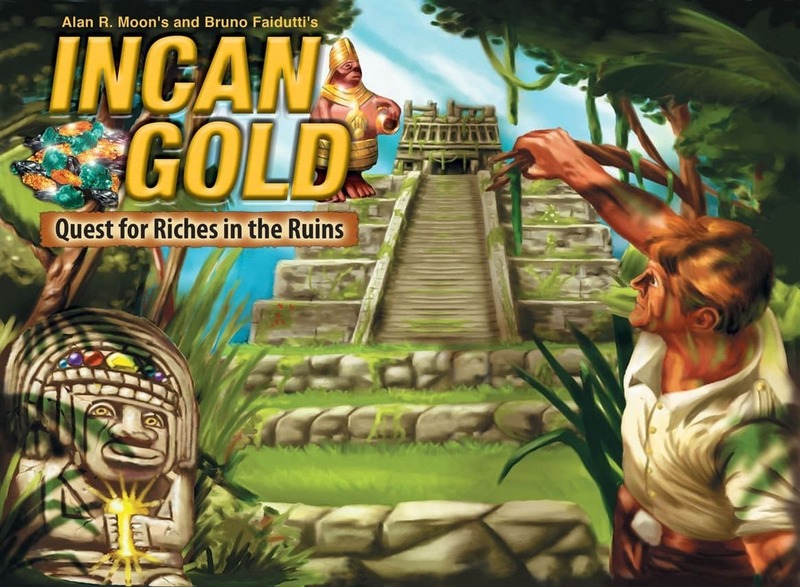 Incan Gold is one betting game that I do actually like and I guess it’s not really betting as much as it’s a risk taking game. You pull a card and each card has a number or a danger. The numbers correspond to the number of jewels you earn for that card if you stay in the round. The only problem is that if you stay in the round and the next card is a danger, you lose everything. Do you stay or do you go? This is another simple and quick one that my family loves. 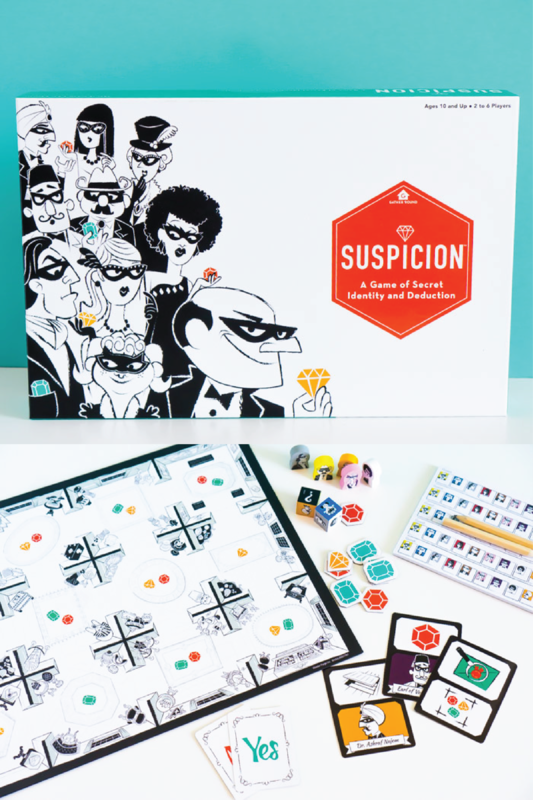 Suspicion is like a grown up version of the classic game Clue. Everyone is invited to a party and comes disguised with a secret identity. You spend the game paying attention to all of the little details and things that happen to try and figure out which character is which player. This is one of our newest games we got for Christmas this year and a new favorite. Along with playing our favorite party games for adults, I always try to have at least one or two party board games at each of my parties. 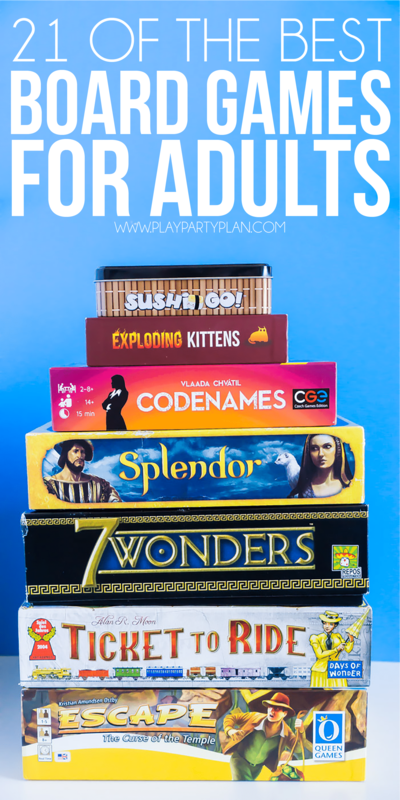 These are some of the best board games for adults when you need to entertain a large group or have people that want to play loud and hilarious games. These are less game night games and more adult party games. One of the key factors for me putting a game in this section is that it needs to be something easy to learn. Most of the time when people come over for a party, they aren’t up to learning a game like Pandemic that takes a good amount of time to pick up. 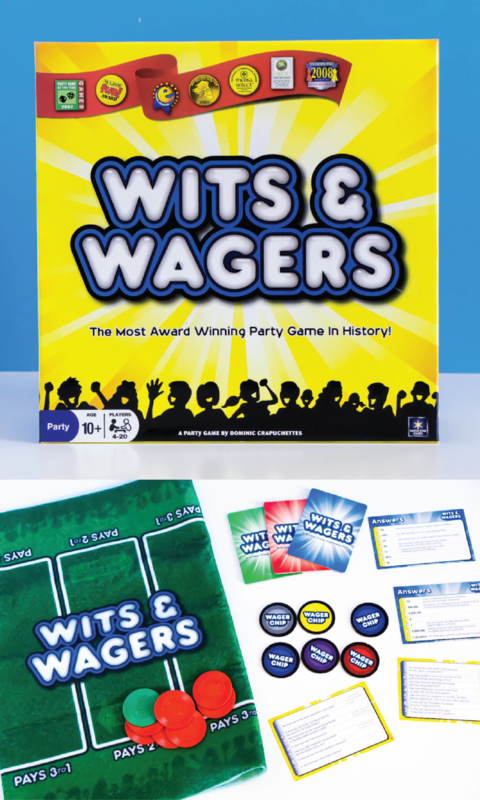 These party board games for adults are easy and quick to pick up. 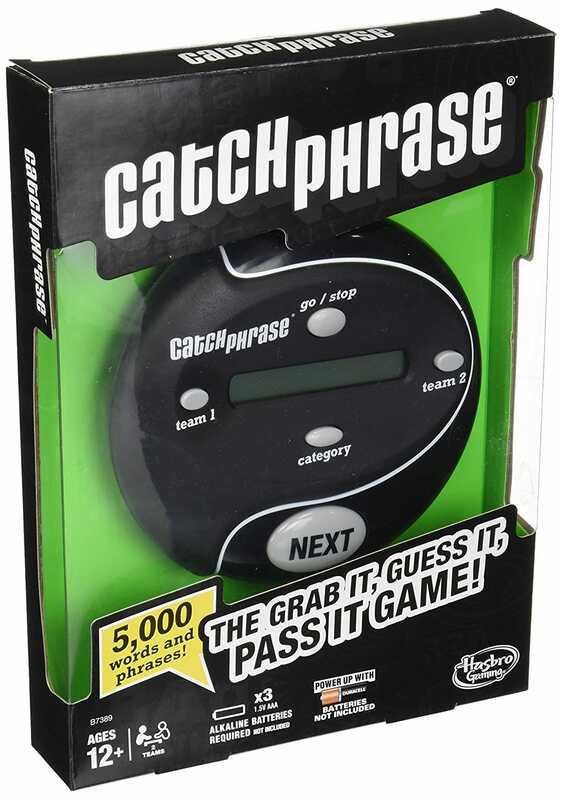 Catch Phrase is a total classic game I’ve been playing since high school, maybe even before that. But it’s one of those games that we break out pretty much every time my family gets together before when everyone is tired, or even not tired, it’s hilarious every time. You split into teams and when it’s your turn, you’re given a word that you have to describe to your team without saying the word or acting it out. I can’t even begin to explain what funny things come out of people’s mouths when they’re under pressure and trying to describe a word. I’ve seen the smartest people say some of the dumbest things, and it’s a game so we all just laugh. 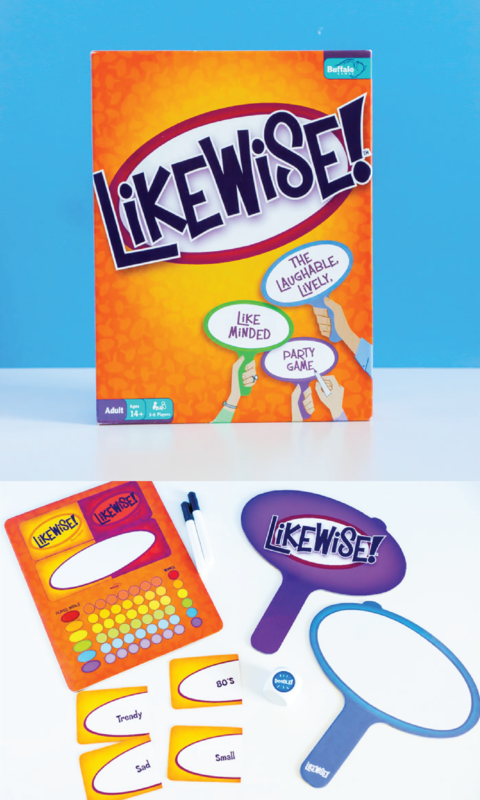 If you’re going to have one party game in your house, Catch Phrase gets my vote. 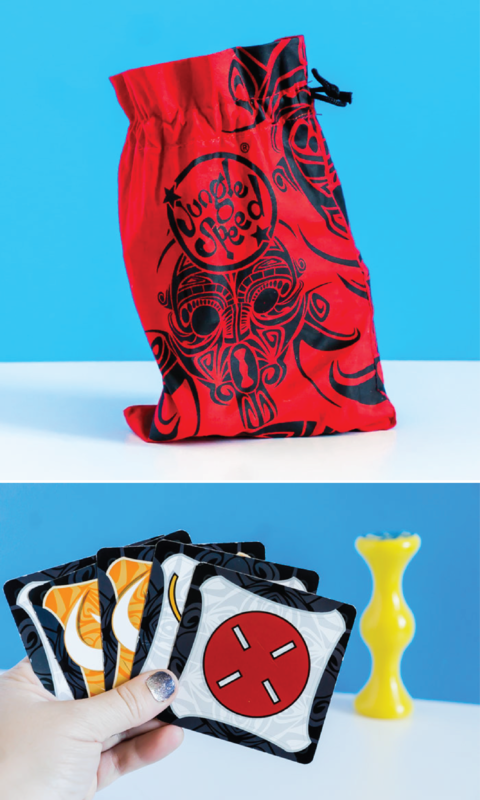 Jungle Speed is a fast-paced game that’s meant for up to 10 players. Everyone gets cards, everyone plays cards, and everyone has to pay attention to said cards to see if they have a match with anyone else who has played a card down. If they match, they have to be the first to grab the totem pole in the middle of the table. I had no idea this one would be so funny until we played it about 25 times in a row one night. What happens when you tell five grown men to act out the word belly flop? You watch five grown men belly flop onto a hard carpet while another grown man tries to guess what in the world they’re doing. 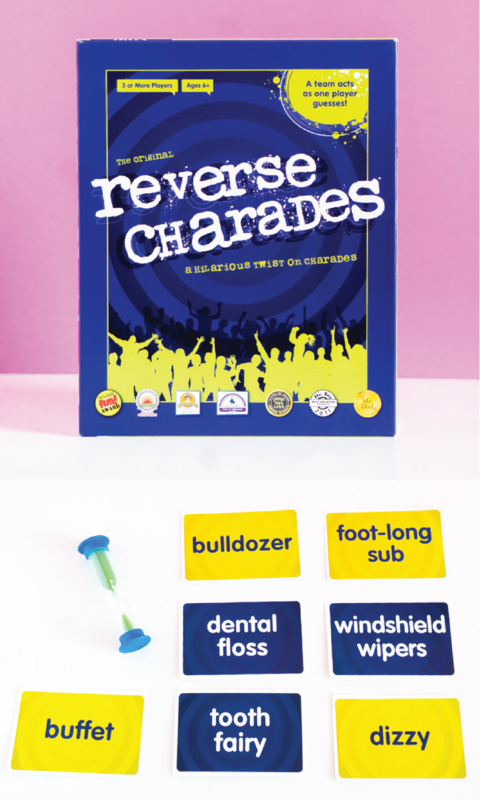 That’s the idea behind Reverse Charades – you’re literally playing charades in reverse. The entire team acts things out while one person guesses instead of vice versa. I’ve never laughed so hard as when we played this at our black and white party! In Likewise, the entire group gets asked a subjective question and everyone answers. The catch is that you’re trying to guess what the majority will guess, not the actual correct answer. Whoever guesses with the majority wins points! If you ever played Mafia when you were a teenager, this is pretty much Mafia but with a werewolf twist instead. Everyone gets a card with an identity on it. People close their eyes, certain people open their eyes and “kill” others while they’re sleeping. And the rest of the group tries to figure out who the werewolf is before the werewolf kills everyone. 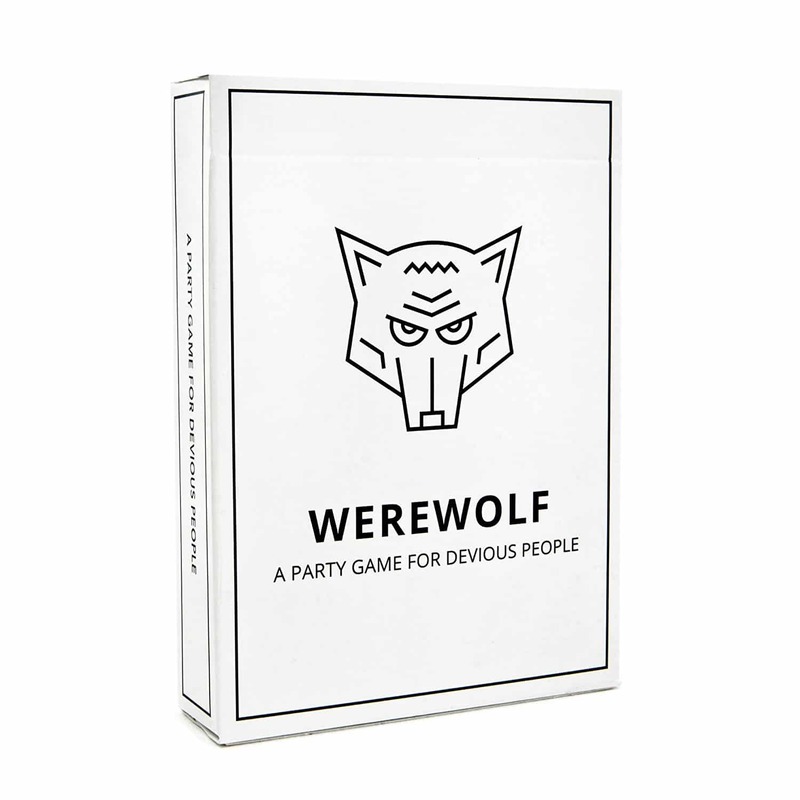 There are a bunch of expansion packs and different versions like one night werewolf and so on, but the original is my favorite. 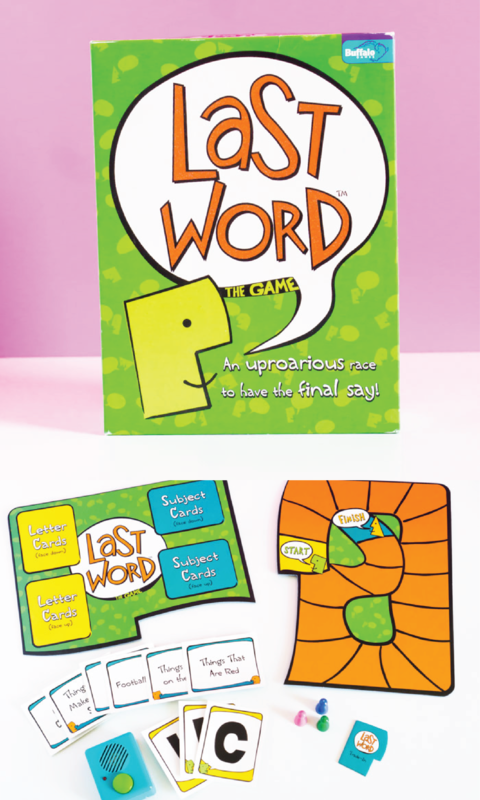 Last Word is a good party game if you have people that like to talk and yell things out. The basic idea is that you flip over a category and a letter and people just start yelling out words that fit that category and letter and whoever says the last thing before the buzzer goes off gets the point for that round. It’s not something I’d play with a super competitive group because we’ve run into fights with people claiming that their word fit the category and others claiming it didn’t, similar to the issues you see with Scattergories. But it’s really fun if the group isn’t going to fight about the eligibility of words! Banned Words is similar to Taboo, if you remember Taboo, where you have to get your teammates to guess a certain word without saying a list of designated words. 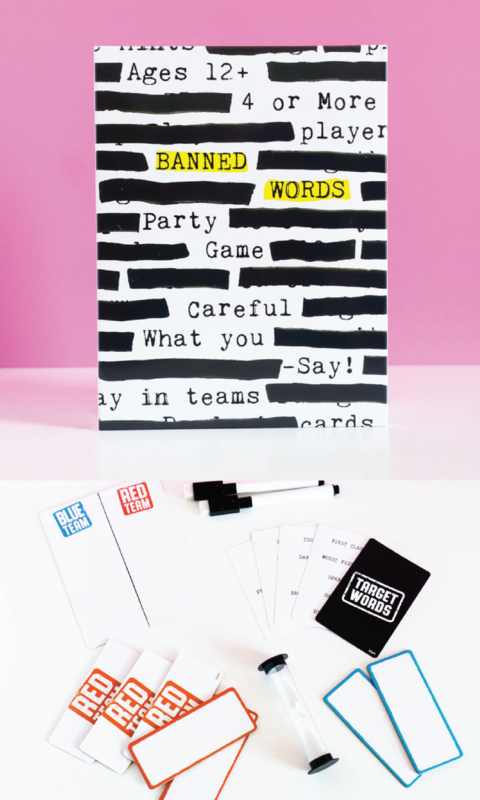 The difference between banned words and Taboo is that in Taboo you are given a set list of words whereas in Banned Words, the other team gets to look at your word and come up with the list of banned words you can’t say each round. It makes it so much harder and pretty hilarious to see what the other team can come up with! These are just some of the adult board games we’ve been playing lately. I know there are plenty of others out there, these are just some of the best board games we’ve tried! What board games for adults should we try out this year and add to this list? Don’t forget to pin these board games for adults for later! Super list. Thank you so much!